Poor alignment to floor, producing a True "Flat Foot". Everted heel alignment from a Compensated Rearfoot Varus. 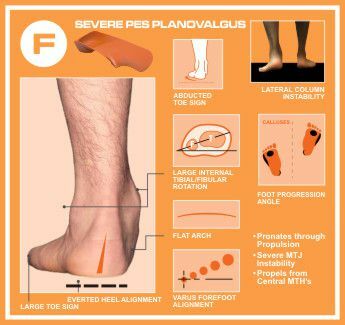 Forefoot Supinatus or flexible forefoot varus. Pronates throughout propulsion with propulsion from central Metatarsals. Severe instability of Midtarsal Joint. Calluses may form to the central metatarsals. Possible callus formation to lateral 5th and medial heel. Approximate presentation in US population is 12%. 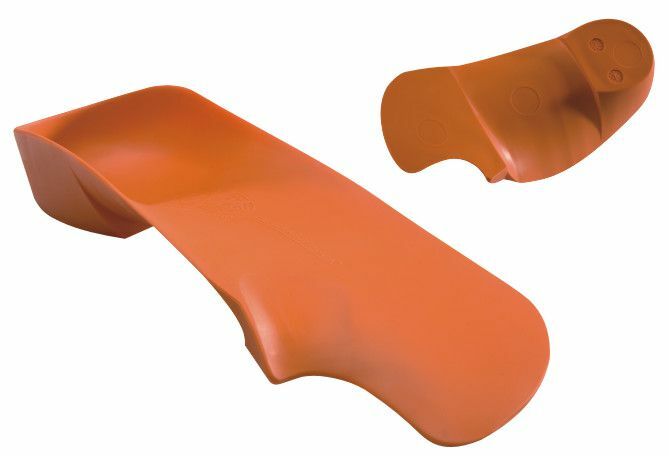 The Quad F foot type is the most hypermobile or flexible of the foot-types with associated hypermobility and instability throughout the foot and ankle. This foot type causes significant damage to the forefoot during propulsion..
CHILD PRESENTATION: These feet look "very flat" at an early age, and can only worsen into adulthood. This severe instability also makes it difficult to develop and maintain core strength throughout the legs and trunk. This flat foot usually remains and continues to worsen after the age of 3-4 when the arch forms. This is a foot type that will usually not be "out-grown" over time. The best way to determine the progression of the child's foot is to evaluate older siblings feet or ask Mom and Dad to remove their shoes and socks. WALKING PATTERN: Severe over-pronation with collapse of the foot and medial collapse of the ankle. May be called "fallen arch".